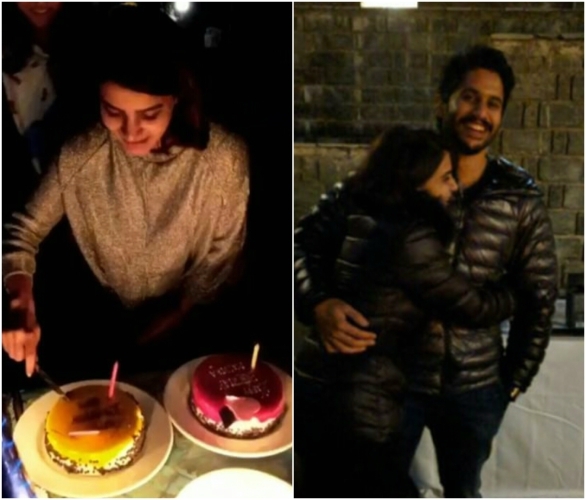 Samantha Akkineni posted couple of pictures and a video of her birthday celebrations in which she seen cutting the special cake for her birthday and in the presence of Chay. Wherever I may be, these brats will always find a way to send me cake and make me look like the lesser human . I love you’ll to death and yeah yeah 💯 @vanrajzaveri @kreshabajaj #0 Me!! Despite a busy schedule, Samantha took time out for her birthday and flew to Kashmir to ring in her birthday along with hubby Naga Chaitanya and few close friends. The photos and the videos on Samantha Akkineni’s Instagram page reveal that the couple are put up at a beautiful resort in Kashmir which has serene view of the valleys. On the work front, Samantha Akkineni has handful of movies in Telugu and Tamil biggest of all being the biopic on iconic actor Savitri which is titled Mahanati. Directed by Nag Ashwin, Mahanati will Samantha Akkineni playing a scribe and the story of Savitri will unfold from her perspective in the film. Samantha Akkineni will be pairing up with Vijay Deverakonda for the first time in Mahanati. Mahanati is slated to be released on May 9th, 2018 worlwide. Besides Mahanati, Sam also has Irumbu Thirai alongside Vishal which is slated to be released on May 11th, 2018, the same week as Mahanati. And this will also be the first time that Samantha Akkineni will be acting alongside in her career. She’s so irritating. Too much wannabe.